The Rev. Dr. Eric Kimball Hinds from St. Matthew’s Church in San Mateo, CA gave the keynote address at the Province VIII Altar Guild Meeting in September. I am very happy to be with you this evening to share some thoughts about the special ministry of serving on the altar guild. 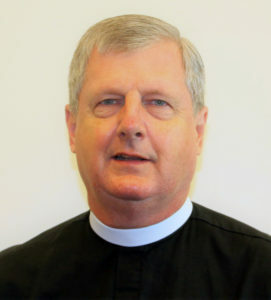 I am Eric Hinds from St. Matthew’s Church in San Mateo, California — south of San Francisco. I have been a parish priest for almost 25 years, but my connection to and appreciation for the work of altar guilds has a much longer history. My first awareness of the ministry of the altar guild comes from my childhood. I remember my mother regularly excusing herself from life at home to work with other altar guild members. At the time I had no idea what she did during that short time away. I simply knew that it had something to do with getting the church ready for services the next day. As a young adult, I always had a great appreciation for the beauty of the liturgy and the ordered way in which it seemed to effortlessly unfold. The details, what took place behind the scenes, was largely unknown to me. I eventually came to appreciate that this quality, an inability to discern the details of the work of the altar guild, was actually a high compliment, for it meant that everything was in its place contributing to the unity of worship without distraction. A very great compliment, although it has the corollary effect that the details of your good work may not be fully appreciated by the congregation at large. It was not until I attended seminary, that I really gained a deeper appreciation for the work that altar guilds perform. I attended The General Theological Seminary in New York City where the Seminary Chapel hosted 21 worship services a week including a daily Eucharist. With a high emphasis placed upon daily worship, it makes sense that the highest leadership position that a seminary student at General could aspire to was chief sacristan. At my seminary, the ministry of the sacristans was a combination of the roles of altar guild and ushers all rolled up in one. A sacristan prepares the sanctuary, marks the liturgical books and bible, sets the hymn boards, checks that each of the worship participants was accounted for, and rings the chapel bell announcing a service was to begin. Sacristans were always on hand in case anything went amiss during the service. After the service, the sacristan’ cleaned up and made sure that everything was in its place before leaving the sacristy. For me, this was a deeply meaningful ministry — and upon reflection, I now understand that the significance and meaning of the ministry of serving in the Chapel was amplified by many of my seminary studies. This is when I first began to think about serving in the sacristy and sanctuary as a spiritual ministry- one that nurtured and fed my soul. So my two years serving as a sacristan were both the beginning of my deep appreciation for the work of altar guilds — and it was the beginning of my thinking more deeply about the various strands of that service which feed my own spirituality. You are a special group charged with the awesome responsibility and privilege of tending to the beauty, peace, and tranquility of worship. This is a special ministry — one that is both often taken for granted and under appreciated. The way that we talk about the ministry of the altar guild can contribute to congregational misunderstanding and under appreciation of the good work done by altar guilds. We tend, of necessity, to focus primarily on the tasks at hand, getting a set of jobs done, which is certainly understandable. We want to be efficient, to be thorough, and consistent. But, if our focus is always upon the TASK at hand — we might be led to only using similar language. Using words such as: duty, obligation, checklist, clean-up, done in time, chores, housekeeping or work, and perfection. When you hear them said together, it becomes clear that these are not the words that a successful evangelist for altar guild service would use. A more attractive set of words to describe altar guild service might be: ministry, offering, sanctuary, awe, meaning, fulfillment, contentment, and peace. This is more than just a semantic exercise for that way that we talk and think about our ministry — in a very real way words can shape not only our own perceptions but also the way that others see serving on the altar guild. When we begin to think about service as more than a checklist, we discover that deeper spiritual vistas open up and that our service can be something that feeds and nourishes our faith. In her write up to promote this conference, Albe used a biblical story that, in a household setting, contrasts the busy and diligent Martha, with Mary, who forsakes the work at hand to sit at the feet of Jesus. In this vignette, it is Mary who is praised for making the superior choice. I will say more about Martha and Mary later — but for now I will simply suggest that we do not have to settle for an either/or proposition in this story. Martha or Mary. Activity or Spirituality. I would like to explore with you another set of contrasting biblical images. The first image is that of the grandeur of the entire creation and our associated understanding of the essential sacredness of all of creation. This idea is expressed in the very first story of the Bible — the story of creation found in the book of Genesis. In this account, one has the sense that: the waters, the land, and mountains, the sun, moon and stars, the creepy crawly things, the sheep, cattle, fish and humans, are all part of God’s sacred creation. In contrast to this foundational notion that all things everywhere are sacred — there also emerges the idea that some places are imbued with a special sacredness — a sacredness that usually connects to an experience of God’s presence. From the book of Exodus, we have a familiar story, the story of Moses encountering God through the burning bush. And in that encounter, Moses is instructed to take off his sandals, for he is standing on Holy ground. If we follow the story of Moses, we observe that later in the book of Exodus, there is a series of encounters, where Moses climbs Sinai and ascends the cloud-covered mountain to encounter God. Moses does this alone, multiple times, and after receiving the Ten Commandments, an interesting thing develops. Rather than Moses continuing alone to intercede on behalf of the people with God, a tent for meeting, a kind of transportable sanctuary or Tabernacle is established by God, to be a place of worship for the people of Israel. This will serve the people through their 40 years of wandering in the desert; and at the same time, the people are instructed to build the Ark of the Covenant, a container used to house and carry the Ten Commandments. And so, as Moses and the people wandered in the desert, the portable tent of meeting, the Tabernacle and the Ark of the Covenant went with them. Together the Tabernacle and Ark indicated the place of God’s presence with the people. Now you may think that we are far afield from Altar Guild: A Spiritual Ministry, but bear with me. The Tabernacle was constructed so that the Ark was housed at one end in a space known as the Holy of Holies, so we have the beginnings of a worship space organized with increasing levels of a sense of holiness. This pattern becomes fixed and more rigid when Solomon builds the first Temple in Jerusalem. In the Temple there are even more clearly defined areas, characterized by increased perception of holiness. When an ancient worshiper arrived at the Temple Mount, they first encountered the open air Court of the Gentiles, a large space basically open to everyone. Within the Court of the Gentiles was a partition, marked with signs, that restricted access exclusively to the people of Israel. Eventually there was a point (still outside the Temple itself) beyond which Jewish women were not allowed to enter. Within the Temple building proper, there is then a section that only the priests can enter known as The Holy Place. The Holy Space is then partitioned further by a thick curtain, known as the Veil, located at a far interior section of the Temple. Behind the Veil is the space known as the Holy of Holies which housed the Ark of the Covenant. This is the site of God’s presence, and the people of Israel understood that whoever passed beyond the Veil and entered the Holy of Holies, was entering into the very presence of God. So here is the most restrictive space of the Temple, where one encounters the awesome presence of God — not a casual event. Only the High priest was allowed to enter the Holy of Holies, and that was only one day of the whole year — the Day of Atonement. After proper purification and offering of sacrifice, the High Priest entered the Holy of Holies with coals and incense, ensuring that the space would fill with billowing clouds of smoke, as he prepared to offer an atoning sacrifice on behalf of all the people. And so one can see how the liturgical space of our churches falls roughly in line with the evolution of the sacred space of the Temple, where there is a sense of progression towards the most holy or most sacred space. Consider most of our churches: most people enter at the furthest point from the altar. A much smaller pool of people has access to the sanctuary area. This sense of sacred space directly affects us in our ministry for it affects our response to the space in which we move and work. At one level, we can affirm that God is everywhere, and harking back to the story of creation, we can affirm that all of creation is sacred, yet we also have a strong experience of some places being sites where we experience God’s presence more intensely. The area of the Sanctuary is the area that it is our privilege to serve. Clergy, altar guild, acolytes and Eucharistic ministers each serve in this area. In addition to the long liturgical history that contributes to our understanding of the sacredness of the space, each of our specific congregations has its own unique sacred history- years, decades, or in some cases centuries of regular worship. Our sanctuaries are well-prayed-in spaces that, in addition to regular worship, have also hosted the sacramental rites of baptisms, weddings and funerals. At times, our sheer familiarity with the liturgical space can let us take it for granted — so part of our challenge of claiming a spiritual ministry is ensuring that we connect to that sense of awe and reverence that is already wrapped up within our worship spaces. Most gracious Father, Who has called me Your child to serve in the preparation of Your Altar, so that it may be a suitable place for the offering of Your Body and Blood; Sanctify my life and consecrate my hands so that I may worthily handle those Sacred Gifts which are being offered to You. As I handle holy things, grant that my whole life may be illuminated and blessed by You, in whose honor I prepare them, and grant that the people who shall be blessed by their use, may find their lives drawn closer to Him Whose Body and Blood is our hope and our strength, Jesus Christ our Lord. AMEN. Mark David Oakley, one of the Canons of St. Paul’s Cathedral in London offered what was for me a tremendously valuable insight. He said that to nourish your spiritual life, you should think of assembling a collage of those things that you encounter on your journey which have some sort of special meaning. When you come across something that resonates — make sure to: savor it, save it, write it down, and use it for your ongoing spiritual nourishment. And so here is a prayer that resonates deeply. It comes from John O’Donohue’s book To Bless this Space Between Us. May it release wellsprings of refreshment, inspiration, and excitement…. When you start looking, you will find all sorts of prayers. Here is possible prayer to offer at the conclusion of one’s service. Our Father, as we now finish the work of the Altar for this day, we commend that work to your mercy and ourselves to your keeping. Bless what we have done to the furtherance of your kingdom, and bless us your servants in the fulfillment of our calling to serve you in the Altar Guild. Send us forth in peace and in the power of your Holy Spirit. We ask it in the name of Jesus Christ our Lord. Amen. Having spoken a little bit about the sacred space we enter and how we might approach our service, let’s return to the story of Mary and Martha. If one were to venture a short summation of the prevalent interpretation of the story it would be: Busy Martha=Bad; Contemplative Mary=Good. If St. Benedict were to comment on the story of Mary and Martha, I am sure that he would contend that the traditional interpretation is a false choice. “Proper cooking can only be done in the spirit of a sacrament and a ritual. It is an act of worship and thanksgiving, a celebration of the glory of life, and no one can cook well who does not love and respect the raw materials he [or she] handles: the eggs and onions, the herbs and salts, the mushrooms and beans, and, above all, the living animals—fish, fowl, and flesh—whose lives we take to live. That is a very Benedictine approach. And it is the intention of loving awareness and reverence that translates to the ministry of serving at the altar. All the work of ironing, polishing, storing, cleaning, mending, flower arranging becomes a means to encounter the holy. In seminary, my time spent in worship increased dramatically. As I mentioned, we had 21 worship services a week. In addition, an enormous amount of my time was devoted to intellectual study. I discovered I missed the time for spiritual reflection I had when doing work with my hands. I managed to solve this in two ways — both were in their own way unexpected. During my first year of seminary, I started working in the refectory on the clean-up crew, where my job was to take the racks of clean dishes out of the Hobart steam cleaner, and then stack and shelve and store them for the next meal. While the pace was fast, it was repetitive and to my surprise this activity fed my spiritual life. The other thing that I did was more intentional. Our Seminary Chapel was a gorgeous liturgical space. It happened to be appointed with a prominent brass altar rail. You can read that also as a super magnet for collecting children’s fingerprints at the weekly family service. I discovered that over and above the duties of a sacristan, I loved stealing away to spend some time in the chapel to polish the brass altar rail. Strangely, a different experience from simply sitting in the Chapel. Today, I still find serving in the sanctuary a deeply spiritual experience. I hope that by sharing some thoughts about the spiritual underpinnings of our common ministry that your life of service with the altar guild has been enriched.